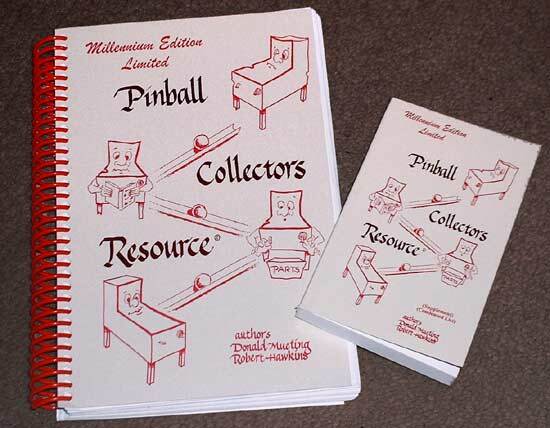 In our continuing series of pinball products we turn our attention to the Pinball Collectors Resource books from authors Robert Hawkins and Donald Mueting. Opening the brown cardboard box reveals not one but two books - the first is the 280 page main volume while the second is a condensed 222 page pocket-sized version of the first. These are the Millennium editions - the most recent - where the larger book is ring bound as good reference books should be, and the smaller is spine bound to make it easier to carry. It is important to be clear what these books are, and equally what they are not. They are reference works, and as such are not really designed for browsing or bedtime reading. There are no pictures, anecdotes or opinions between the covers. They provide a wealth of information organised in such a way as to be readily accessible to anyone looking for details of a particular game or series. The best place to start is the "How to use this book" section of the larger of the two volumes. It walks the reader through the other sections and the layout and abbreviations used. Unless you use the books very frequently you'll be referring back to this section a lot. Fortunately it's right at the front and thus easy to find, but it does reveal one limitation of the design of the books. They are all text. Now text is fine but the column headings are often just single letters and they need some explaining in the opening chapter. If small icons were used instead it would be more obvious and memorable. The best place to start is the "How to use this book" section of the larger of the two volumes. It walks the reader through the other sections and the layout and abbreviations used. Unless you use the books very frequently you'll be referring back to this section a lot. Fortunately it's right at the front and thus easy to find, but it does reveal one limitation of the design of the books. They are all text. So what is all this information? First is the pinball manufacturers list that lives up to its name detailing the 778 manufacturers, their years of operation and number of models made. It also includes the abbreviations used later in the book for the manufacturers' names and picture sources. 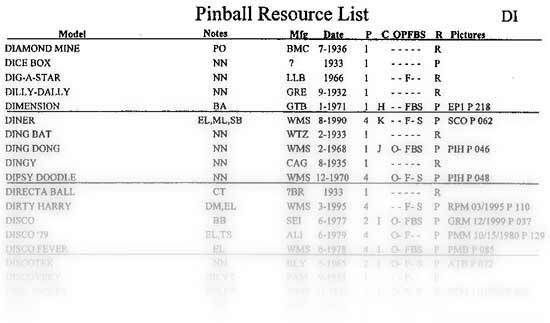 Next comes the main pinball resource list. Playfield/Plastics: Are these parts available? Flyer: Is a flyer or layout known to exist? Backglass: Is a backglass available? Schematic: Is a manual or diagram known to exist? References: Do other references beyond those shown exist? Pictures: References to pictures in books or magazines. Obviously there is a very limited amount of space to include many references to additional information about a game. For that reason, when you purchase these books you are encouraged to exchange information with the authors. You can request all known information about a game and equally you can send in information for future inclusion. There are forms at the back of the main book for this. Some of the data contained in incomplete due to lack of entries in the authors' databases and unverified information. Ironically, it is the more modern machines where this is more obvious with no known ownership listings for The Addams Family or Twilight Zone as examples. The conclusion must be that owners have to be ready to submit their entries to the authors while they could be more pro-active through the Internet owners lists in approaching owners. The book lists 6130 games, although that may be slightly optimistic as some games are listed more than once under different names (e.g. "RoadShow" is also listed as "Red & Ted's RoadShow"). Even so, it's a real eye-opener to see all the different models manufactured and you start to appreciate the workload involved in cataloguing all of them. 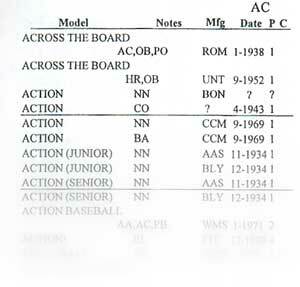 After the main body of the book is a list of abbreviations used in the Notes section described above. This section is especially well written and instructional. There is almost a page and a half on Add-A-Ball alone. Anyone looking for background information on older games and their features would do well to read this 30 page chapter. After that is the Chronological List By Manufacturer which takes each manufacturer in alphabetical order and lists all the games they are known to have made together with the year or month they were first made or sold. It is surprising how many of those 778 companies only ever made one game while Bally's list stretches across eight pages! One list I would like to see here is the combined William's/Bally games - the ones made after the merger. Many newer collectors will know that a game was a WMS game but perhaps not know if it was branded William's or Bally. The final section is called Appendix "A" - Conversions. Logically enough, it lists those games which were conversions of other games, the date they were made, the converting company and the source machine. Most of these were 1930s or `40s games but there are some interestingly recent ones too. So that's what you get in the big book. The companion volume is a distilled version of the main section of the larger book, listing game name, notes, manufacturer, date, players and manufacture count. This book is really to take with you to sales or auctions if you aren't sure what games will be there, or you're looking to pick up a rare or interesting model. Reviewing the Pinball Collector's Resource books has been a curious and interesting process because clearly these books aren't produced for the likes of me. Yes I have a collection of games but I know that doesn't make me a collector in the sense that I buy games without knowing exactly what I'm buying and even then only about one game each year. For me, the larger book holds some interesting information but that would only be scratching the surface of its usefulness. For the very occasional buyer or non-owner its benefits are less tangible and perhaps the information on the web would suffice. There are, however, a number of true collectors and buyers who would derive considerable benefit from both books and can contribute to the databases held by the authors. For those people the $29.95 price tag is well worth it.